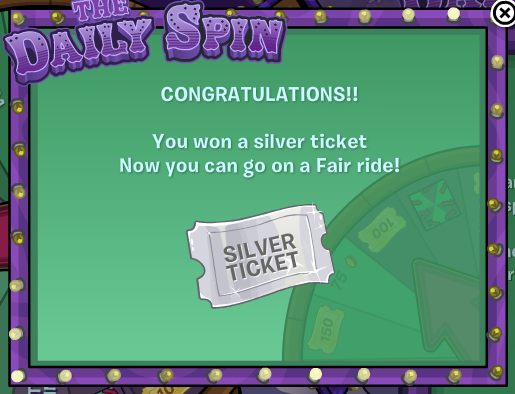 The Fair 2014: I Won a Silver Ticket at The Daily Spin! What does it do? I logged into Club Penguin and decided to try The Daily Spin. I felt really lucky. Turns out my luck was true because I won a silver ticket! If you want to know what a Silver Ticket gets you or some tips for using The Daily Spin then keep reading. A lot of people think that trying to spin the wheel as fast as possible is better. In my opinion, spinning fast is worse. I usually try to spin the wheel, not slowly, but gently. I do it this way every time and it works for me. What exactly does a silver ticket get you? Well, it depends. For non-members, a silver ticket lets you go on a fair ride once. For members, it gives you 1,000 free coins. Members can go on a fair ride as many times as they like. Go and try the daily spin if you haven't today, remember the tip I told you and you might just win a silver ticket or something better!